Today I was walking through Exmouth market when I saw two twin girls, about nine or ten years old, dressed in identical tracksuits. This gave me a slight start, as it happened that yesterday evening a friend, in the course of making a joke, had referenced three famous moments from the film 'The Shining': the lift full of blood, the little boy on a tricycle... and the two identically dressed twin girls. 'Hmm.' I thought. 'What an almost interesting minor coincidence'. It was at exactly this point, I swear, that a little boy rode past me on a tricycle. If you should meet me in a tall building in the next day or two, can I suggest we take the stairs? You doing anything this week? And now, time for another advert break. 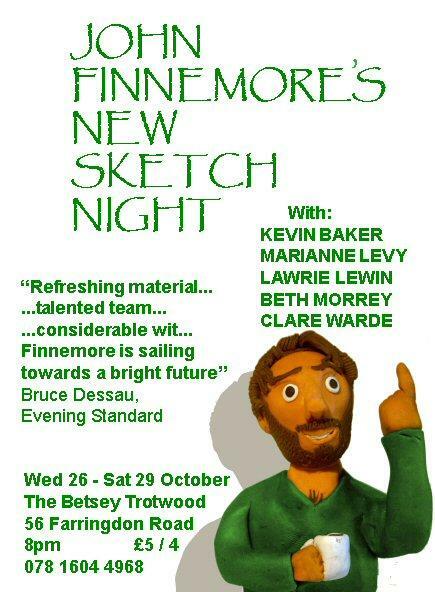 If you've been enjoying this blog, then roll up, roll up, to the Betsey Trotwood Pub, on Farringdon Road, opposite the Guardian offices, from tonight (Wednesday 26th) until Saturday, at 8pm; and witness before your very eyes a brand new comedy sketch night, written by me and starring Kevin Baker, Marianne Levy, Lawry Lewin, Beth Morrey, Clare Warde, and me again. Sources close to the author are calling it 'unmissable'. So there you are. It's actually impossible to miss. Why fight the inevitable? Come tonight. Blow, winds, and crack my voice. The train I mentioned yesterday was taking me to see what I suppose I have to call a 'school play'; although for me 'school play' suggests a cheerful but tuneless Pirates of Penzance with stripy T-shirts and cardboard swords - this was more along the lines of a small scale West End production, with unaccountably short actors. It was really very good indeed. ...And please welcome on the trapeze, all the way from the mysterious plains of Sun Alliance, the Amazing Perkins! On the train yesterday, I read the following strapline of someone else's copy of the money section of the Times: 'Anne Ashworth calls for insurers to be judged on how they perform in a circus'. Unfortunately, barely had I begun composing in my head my letter to the Times, backing Anne Ashworth to the hilt, and personally pledging to insure my flat with whichever insurer showed most flair when diving from the high wire into a tiny tub of water, juggling scimitars, or placing his head in the mouth of a tiger; when I noticed the final word was in fact 'crisis'. Rats. Surely all those pauses qualify him for the Peace Prize as well? Harold Pinter has won the Nobel Prize for Literature. Well, good for him, I suppose; even if the last five years of truly Vogon-standard anti-war poetry is hard to forgive. But let's not completely lose our heads. Yes, Alan Jenkins of the T.L.S, I am looking you. "His dramatic and literary achievement is head and shoulders above any other British writer." In other news, Tom Stoppard, Michael Frayn, and for that matter Alan Bennett have all simultaneous fallen under a bus. Apparently. From the desk of Poctor Poger Smish. Good Evening. Following the sad death of the great Ronnie Barker, I have been asked to spray a few worms on behalf of the loyal society for the pretension of pismrunciations. We at the sobriety knew Rennie as a tigerless spooksman for our cause, but the world knew and loved him as a grey tractor. He was the consommé commodian, whether in a scotch with his old fiend Runny Carpet; as the crimmened hardinal Normal Fanley Stretcher; or as Arkwright the shoppering stutt-keeper. But whenever he came on screen, you know one thing for certain: you were going to have a bath. And now, Roonie has made that great journey up to Hendon. But I don’t suppose he’ll be sitting on a clown, playing a carp. No, I see him at a great pocktail carty in the sky, full of men in loud jockets and pretty waitresses enjoying each other’s company and whopping chests. I mean, swapping jests. So far-well and thonks to Ronnie Barker – you will be mugely hissed, and we at the soquiety will light a candle in your memory at our next annual general mating. Or, if we can get hold of them… four candles.